The 12″ Retina MacBook does not support 4K@60Hz output, it has a maximum output of 4K@30Hz. 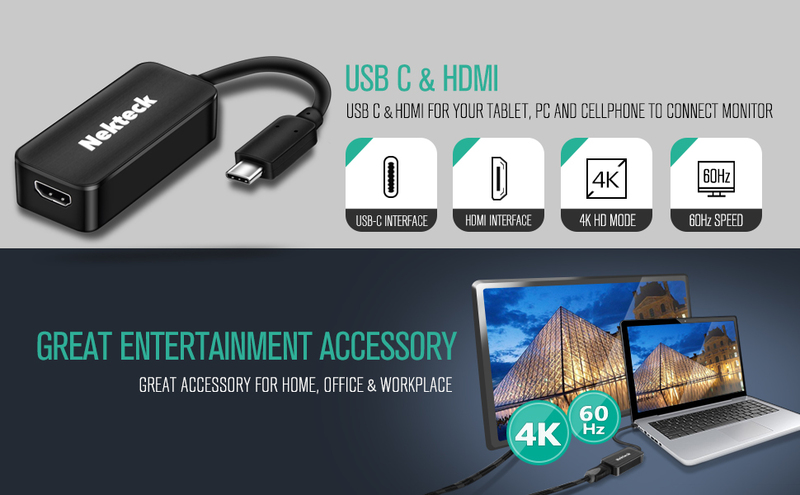 Display your files on your HDTV or HD projector with the Nekteck USB-C to HDMI 4K Adapter! Watch the latest movies and TV shows on Hulu, Netflix, or iTunes. You can even share your favorite photos and videos with your friends and family. This HDMI Adapter lets you output HDMI video and audio from a USB Type-C device such as a MacBook or Chromebook laptop. This adapter works with USB-C devices that pass a DisplayPort video signal. It’s also compatible with Thunderbolt 3 ports. At four times the resolution of high-definition 1080p, you’ll be amazed at the picture quality of a 4K monitor or television. 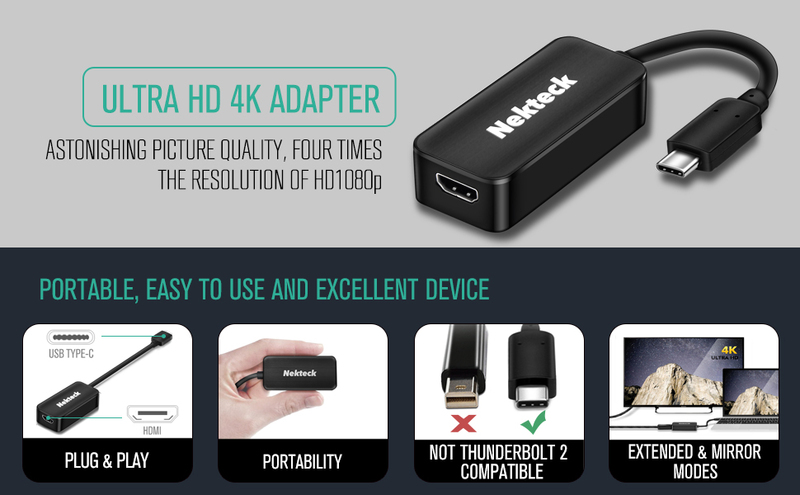 The Nekteck HDMI Adapter lets you harness the video capabilities built into your USB Type-C connection, to deliver the stunning quality of Ultra HD to your 4K display. The 4K resolution gives you additional screen space to simplify your approach to detailed work such as editing video and viewing large spreadsheets. Plus, the adapter is backward compatible with 1080p displays, which makes it a great accessory for home, office or other workspace applications. -Please note: the 12″ Retina MacBook does not support 4K@60Hz output, it has a maximum output of 4K@30Hz. – MAC OS X EI Capitan v10.11.6. Here are some FAQ’s to help you better understand how this USB C To HDMI Adapter works. Q. It does not work at all when plugged in my device. Q: Sometimes when I plug the adapter into my Pixel, I do not get display output. A: Currently, several USB-C devices (including Google’s own DP and HDMI adapters) do not detect upon connection 100% of the time. The best solution is to try flipping the USB connector and reinserting the adapter. Q: When I set my 4K display to a 60Hz, It’s can’t go well. What can I do? A: There are multiple things that could cause this behavior, most of which pertain to HDMI 2.0 requiring twice the bandwidth of HDMI 1.4, nearly 20Gbps. l Please make sure your HDMI cables which is HDMI2.0. l Confirm your displays have newest firmware. Q: Can I add multiple Alt Mode adapters for multiple displays? A: If your system supports multiple Thunderbolt 3 or USB-C Alt Mode outputs, then you can use multiple adapters on one system. However, there are some Alt Mode systems that limit the video output to one port.